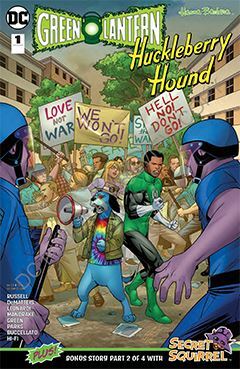 Green Lantern Huckleberry Hound #1 features GL John Stewart, in a tale from his early days in the Corps. It opens with him training with Katma Tui, Sinestro’s successor hen he turned to the yellow side. He is then given a test, to return to Earth and not use his ring. It’s 1972, and with the country in turmoil, divided along political and racial lines, NOT using his ring is going to prove a wee bit difficult. Enter Huckleberry Hound. Once a major name in comedy, he is now down on his luck due to a few ill-received jokes. He and John soon become friends, only to find that friend ship tested on the turbulent streets of Detroit. In the aftermath, Katma Tui reveals what the test truly was, and we see the beginning of the Green Lantern John later became. It’s a good story, but Huck’s presence is somewhat superfluous. He serves as a sounding board for John’s doubts, and provides some pithy life advice, but such a role could have been filled by almost anyone. Why Huckleberry Hound? Because DC decided to team its super-heroes with Hanna-Barbera characters, and Magilla Gorilla was needed elsewhere. The artwork is good. Dan Green’s inks elevate the pencils as usual, as expected. Isn’t that part of an inker’s job? Ande Parks lends a helping hand, which was refreshing. I normally don’t see his work without Phil Hester involved. Not that that’s a bad thing, by any means. Also in this issue is a Secret Squirrel back-up feature, written by J.M. DeMatties. It’s chapter 2 of 4, running through the four DC-H/B comics released this week. I was subjected to Secret Squirrel in the pages of Scooby Apocalypse, which I didn’t enjoy so much. It seemed to run WAAAY too long, but if this holds to four chapters, I may sit down to read them all. I’m just in no rush.